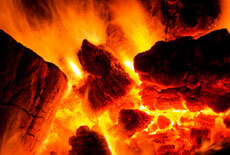 Will Your Casters Survive a Raging Inferno? As long as the apocalypse doesn’t burn hotter than 600° F, your casters and wheels won't reduce to a molten glob. Hamilton’s high-heat resistant rigs are built to survive in blistering temperatures like ovens, powder coating systems and steel smelting operations. • Metal, forged steel and stainless steel wheels are all rated up to 600° F. They’re the best-suited materials for high heat. • Because plastic bearings melt, and standard roller and precision ball bearings each have their own heat limitations, choose a metal bushing that rolls directly on the axle. • Hamilton's standard grease can handle intermittent exposure to temperatures up to 500° F.
• Can't use metal wheels because of noise or floor considerations? Hi-heat Plastex wheels are viable up to 475° F, and they run quietly without damaging floors. We loved watching lasers zap foes in “Star Wars,” so we were even more excited to help a laser manufacturer blast away its maneuverability problems. We recently built this custom cart to transport the company’s laser cannon that strengthens metals on bridges, planes, buildings and just about any structure that needs maximum bonding. 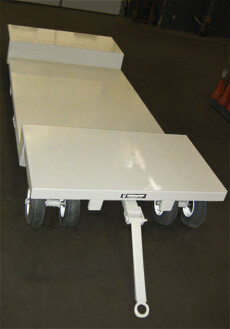 •	64" wide by 158” long lowboy cart uses two-wheel, auto-steer turning mechanism on the front wheels. •	Like a car, the trailer's rear axle is fixed. •	Rolls on dual-mounted 16" pneumatic, rubber-tired wheels with precision-tapered roller bearings. •	Rated up to 7,000 lbs. •	The underslung deck is 91" long by 158" wide and sits just 6" above the ground. •	Fork guides run underneath the entire rig. •	A loop-towing tongue is mounted on the front. •	Four 20" by 20" plates are welded at the corners under the lower deck for easy lifting via jacks. Casters, carts, networking and sunny south Florida? Sounds right up our alley. We’re getting ready to hit the road to Miami for the 57th annual Material Handling Equipment Distributors Association (MHEDA) convention May 5-9. 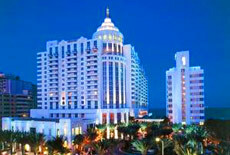 Held at the Loews Miami Beach Hotel, the show directly overlooks the Atlantic Ocean. This year’s theme is “Re-Imagine Your Business,” so stop by our booth 309 and let’s talk about new opportunities in 2012. For more details, see MHEDA.org. When an offshore drilling company needs carts to lug drums around an oilrig, they call Hamilton. When they move the entire 60,000-ton platform, they hitch a ride on the MV Blue Marlin, a heavy lift ship that moves the biggest jobs in the sea. 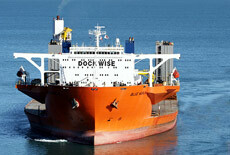 The ship, owned by Dockwise Shipping of the Netherlands, operates around the world from Shanghai to Texas to Amsterdam. It most recently made waves when it transported 18 riverboats from China to the Netherlands in about two months. As you can see, the 738-foot-long behemoth easily moves five levels of the cruisers. Aside from its ability to move huge payloads, the Blue Marlin is unique because it’s semi-submersible. Depending on its cargo weight, the ship can operate partially underwater at a max speed of 14.5 knots. Inside, the ship is equipped with 38 cabins that accommodate 60 crew members who get by with a gym, sauna and swimming pool. Not too shabby for a ship that sometimes sails for more than a year at a time. For more on the Blue Marlin, check out the pictures on Dutch website FotoVlieger. At Hamilton, we’re heavy industry junkies and no strangers to tunnel drilling, so we couldn’t resist sharing this massive story out of England. Eight 1,100-ton metal “moles” are set to bore through underground London and carve out a 13-mile-long labyrinth of tunnels. At a rate of just 330 feet per day, the 500-foot long machines will drill for three years beneath the city’s streets. According to the BBC, it’s Europe’s largest civil-engineering operation. •	Made by German manufacturer Herrenknecht, each mole costs about $13 million. •	According to Crossrail, they’re as long as 14 double-decker buses and could haul 3,000 taxis with ease. •	A crew of 20 will operate each machine 24 hours a day. Fortunately for the workers, every rig is equipped with a toilet and kitchen. •	Hydraulic rams at the front of each machine keep them within inches of their planned routes. For more on these tunnel-boring monstrosities, check out the story on the BBC. Should You Let Your Client Win at Golf? •	No caddies. Your customers probably don’t want to share sensitive business details in front of strangers. •	Let the client win. Whatever you do, let them beat you. Don’t purposely tank holes, but you might rush your shots to add strokes. •	No slow pokes. Always have your next club ready, and tend the flag if you’re close to it. Also, don’t bother searching for lost balls unless it’s your client or boss. •	Curb the spitting. Wipe your clubs with a wet towel or use a small spray bottle. Your customers don’t want to see you hock a loogie after every stroke. •	Zip up the cussing. Unleash your potty mouth only if your guest spews out expletives every other word. For more tips on how to handle business on the golf course, check out this story from Burleson Consulting.